When musketeers.me took over php[architect], the brand was 10 years old. As a matter of fact, all of the partners had been (or still were) subscribers to the magazine. 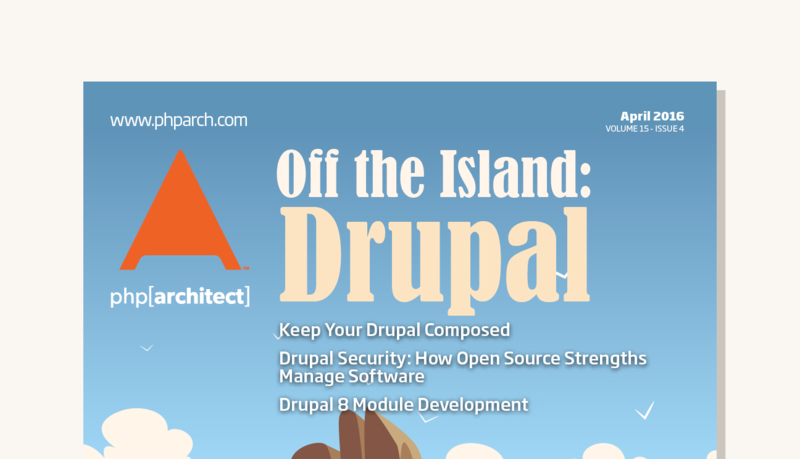 When I first subscribed to php[architect] magazine, I inwardly noted that the design was lacking—it was obvious that the designer was a developer tasked to design a magazine. Over the next year, however, the design rapidly improved. Little did I know that I would be stepping into that designer’s shoes in 2013, and now I was tasked to create a beautiful monthly magazine! By that time, Arbi (the designer) was a pro and did a great job. At the time we took it over, php[architect] magazine was digital-only (it used to be both print and digital). Many people missed the print version, including me—so we set out to see what it would take to bring it back to print. Long story short, 11 months after we took it over, we brought php[architect] back into print. During those 11 months, I revamped the style of the magazine, changing the format from horizontal to vertical as well as updating the body fonts to Gibson and the Headers to SoHo Gothic Std. Ultimately, the body copy moved to Minion Pro for better readability when we reduced the font size in 2016. At first, I illustrated every article—I felt that we needed a consistent look based around graphic illustration. The only photos I used were those of the authors. I ultimately allowed myself to use Shutterstock in the mastheads and covers, but keeping the same graphic standard.